Founded in 1477, the Eberhard Karls University of Tübingen is one of Germany’s oldest universities. It’s thus obvious that students’ life still coins the atmospheric city. But also beyond this, Tübingen breathes history! You may become aware of this during a tour across the historic city center: crooked lanes and beautiful half-timber houses coin the appearance of the blocks. Almost everything is accessible by foot – and many worth-seeing monuments such as the monastery church are just a stone’s throw away from the next impressing building. The probably most famous flagship of the city: the picturesque Hölderlin Tower where the homonymous poet lived during many decades. You should best join a guided city tour to discover all the highlights aligned there. Have you ever heard of the punt? No? Don’t worry: After your vacation in Tübingen, you’ll hopefully know this vessel not just in theory. A punt ride ranks in effect among the wittiest and perhaps also most comfortable options of experiencing the particular charm of this history-loaded unversity town – and this on the Neckar! Around the river banks, there are different carriers inviting their guests to enter the wooden boat. Moreover, there are public rides accessible easily and for little money. Or allow yourself an extravagant pleasure and book a culinary ride to enjoy delicious snacks on board. You’ll feel quite comfortable among like-minded people while being gently “punted” along the river – unless you are in the city for the punt race where it is, of course, about speed! Between the picturesque lanes are hidden owner-managed stores and shops inviting to an unhurried shopping tour. Here you’ll find still handmade products selected with much love of detail. If you are up for culture, you should pay a visit, for instance, to the City Museum or the Hohentübingen Palace with the respective exhibitions. Or simply stroll along and discover other less frequented angles such as Tübingen’s downcity. And Tübingen’s weekly market is also worth a visit: on four days a week, regional market traders offer their fresh delicacies, on Saturday around St. James Church. What else is typical for Tübingen? Its fine Swabian cuisine, of course! The city’s innkeepers prepare dishes in any variations, from hearty to sophisticated ones. Guests should not fail to taste famous dishes such as “Maultauschen” (=pasta squares) or cheeses spaetzle. But also the refined cuisine is at home in Tübingen – and this at various venues. Whatever meets your preferences: accompany it with a true Württemberg “Viertele” (=quarter of wine)! City trip Tübingen: a vacation with PrivateCityHotels. 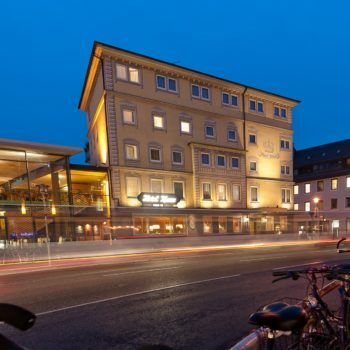 Thanks to PrivateCityHotels., you can feel at home in Tübingen from the very first moment! Book right now your vacation or business trip in Tübingen or select one of our hotels in Austria, Germany, and Switzerland. Or are you looking for a suitable gift? No matter whether as a small thank-you, as a birthday surprise, or on the occasion of an anniversary: a vacation is always a gratifying gift! Place your order online right now via our voucher shop and give away a voucher with the desired amount, redeemable in 16 European cities and more than 55 hotels.